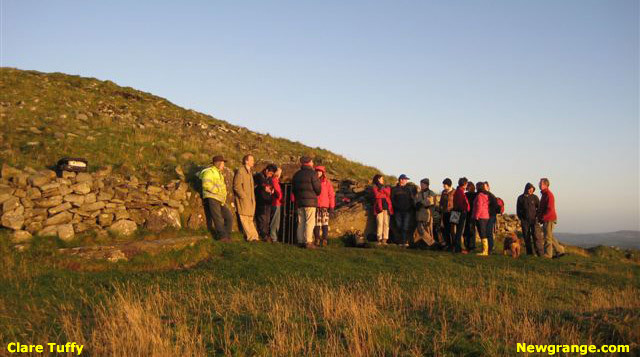 The Office of Public Works staff opened Cairn T, Loughcrew on three mornings leading up to and on the actual equinox morning of the 22nd September. The first morning, Saturday the 20th of September was cloudy, however the sun did break through the clouds for the last 10 minutes of the equinox illumunation period (the full light show lasts about 50 minutes). 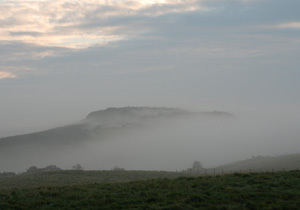 On Sunday 21st September a group of over 100 early risers waited patiently for the sun to break through the mist and cloud, unfortunately the mist and cloud persisted with only fleeting glimpses of light in the chamber. Despite the disappointment the group was good humoured and it was a chance to met old friends and make some new friends. The conditions on Monday the 22nd of September were perfect for the rising sun to illuminate the passage and chamber of Cairn T at Loughcrew. Many thanks to Clare Tuffy for the beautiful photographs. 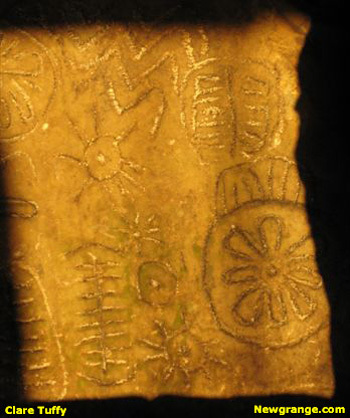 The image to the left is a close up of the Backstone in Cairn T during the Equinox Illumination. 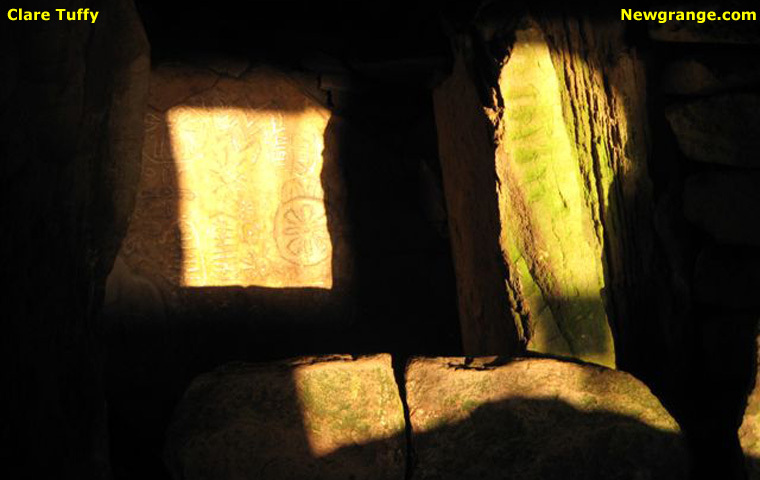 On the morning of March 23rd 2005, I was inside the chamber of Cairn T to witness the spring equinox sunrise illuminate the backstone. Click on the link below to view a video of the event which has been compressed from 50 minutes to 40 seconds. The file is 3.8mb in size and is in WMV format (Windows Media Video). The scene outside Loughcrew Cairn T in the glorious equinox morning sunshine.